In 1939 in Cape Cod the children within this area started coming home telling their parents about a very tall figure that was dressed in all black. And this dark figure was somehow able to just magically appear and disappear just as fast. And the children said that this thing had a hideous deformed face with glowing red eyes and it growled at the children before it disappeared back into the darkness. And of course the kids that came face to face with this entity were terrified and when they got home they were crying and shaking. Now since it was close to Halloween the adults thought that it was just somebody playing a prank and maybe they were taking it a bit to far. But they didn’t really think that it was a big deal. Then one night a women named Mary was walking home when she saw an extremely tall person that was at least 8 feet tall. And this person or entity just came right out from the bushes and slowly move towards her. Mary stated that this thing had long pointed silver ears and its eyes were glowing. Now Mary was scared to death and she watched this dark figure leap away at amazing speeds making Mary believe that this couldn’t of been a human being. And once this thing was gone Mary ran into a nearby coffee shop and she told everybody what she had just seen. And Mary was in such a state of shock that they believed her or at least believed that someone was to blame so the men within the coffee shop went to go see if they could find who ever it was that was responsible for scaring Mary half to death. But they came back empty handed. And over the next couple of days a lot more sightings were now coming in from adults within this area. And the description of this creepy dark figure was always the same. The eye witnesses said that this thing was dressed in all black, its ears were pointy and silver and its eyes were red or in some cases its eyes were silver. And these eye witnesses also said that it produced a very odd buzzing sound kind of like an insect and it could leap or jump very high and it was able to move extremely fast. Now the police were getting bombarded by calls from terrified citizens. And this thing was able to move so fast that it would often be seen in different parts of the town miles away at almost the exact same time. Making people believe that it could teleport or their were more than one of them or it was just able to move that fast. Now it seemed that this entity took great pleasure in scaring people, and now the whole town was in a state of mass hysteria and things were about to get much more violent. A man named Charles said that he had actually shot this creature, but it was completely unfazed by the gunshot and it laughed at Charles before jumping over a very high fence with one single leap. Then not to long after another man claimed that he was cornered by this entity and this man tried to punch it but it was able to catch his fist in mid air, then it crushed and broke this mans hand before throwing him down to the ground like a rag doll. Another eye witness claimed that this entity was able shoot blue fire out of its mouth, and another one said that he was hit so hard by this monster that he actually flew up in the air making him believe that whatever this was possessed super human strength. Now this demonic like creature was getting very famous and there were now many names for it such as the Black Phantom, the Phantom Fiend, the Devil of the Dune, and the media called it the Black Flash making this the most popular name and from that point on this entity was now known throughout the United Sates and the world as the Black Flash as it was able to move so fast. But many believed that it was nothing more than a very talented human prankster. But for the ones that actually came face to face with this entity they believed that it was the devil himself. And these encounters went on for another 7 years. In 1945 the police went to go investigate a schoolyard as there were a series of very recent sightings of the black flash. And when the police got there they saw it, and it was able to jump over a 10 foot tall fence and it got away. Then a month later a group of school children were attacked by the black flash. And the children said that they ran into a nearby house to seek refuge and the children and the residents within this home started to hear loud bangs on the walls and the doors started to mysteriously rattle. 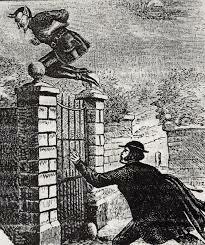 Another very interesting thing about this case is there was another mass sighting in England in 1837 and they called this entity spring heeled jack and the description of this phantom is pretty much the exact same as the eye witness accounts from Cape Cod. Such as it was very tall, had glowing eyes and it could jump very high and move very fast. Making many believe that spring heeled jack is the same entity as the black flash and these encounters were almost 100 years apart. Now according to a well respected paranormal researcher all these encounters that happened in Cape Cod only really happened for a few weeks as some of the eye witnesses didn’t report their encounters until years later, making it seem like a 7 year stretch but in reality it only lasted for a couple of weeks. Which would make sense as paranormal encounters like these such as the mothman, the van meter visitor, the Enfield horror etc.. only seem to appear for a short period of time. Then these paranormal creatures vanish back into the shadows from which they came.